The church commemorates those who died in service or were killed in action in World War One. The foundation stone of the church was laid in 1920 and the church was dedicated on the 26th November 1921. An article in the Gippsland Times in 1921 (17 Feb 1921:3) reports that many people had contributed towards the memorial church, in memory of particular soldiers who fell in the war. The article notes that Mrs J. 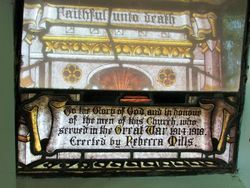 Mills of ‘Powerscourt’ donated a window ‘The Great Sacrifice’ in memory of all fallen boys. The window design is taken from a painting by James Clark which was printed in the 1915 Christmas supplement of the London illustrated journal, The Graphic, which reproduced the painting. The image was quickly popularised and adapted for commemorative stained glass, including three known examples in Australia. 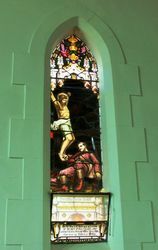 Mrs Rebecca Mills was a benefactor to several of the district’s Anglican churches, having also donated a commemorative window to St John’s in Maffra, in addition to supporting returned servicemen. (Vic War Heritage Inventory). The following memorials were placed within the church, as listed in Back To Heyfield (1971:13): a blackwood font in memory of Private Alfred Muston; the memorial window ‘The Greater Sacrifice’; a litany desk in honour of the men in Toongabbie; a lectern as a thank offering for peace; a sanctuary chair in memory of Private Ernest Pallot; sacred vessels as a thank offering for peace; an alms dish in memory of former Sunday School scholars who fell in World War I; a ‘set of frontals Dossals Riddels’ and Sanctuary carpet; kneelers for communion rails; linen for the Holy Table; and furniture for the Clergy vestry. Source: Wellington Shire Stage 2 Heritage Study Vol 2 ‖ Sep 2016. The Bishop of Gippsland (Dr. Cranswick) on Saturday afternoon last dedicated St. James' Church, Heyfield which has been erected as a soldiers memorial. The church is a very handsome brick structure, with beautiful fittings, and stands in a high position overlooking the town. The cost of the building was £2689, and £1300 was raised before the dedication, while the collection that day realised £111. Seventeen members of St. Paul's choir Sale, supplied the choral part of the service. The Bishop was assisted in the service by Archdeacon Hamiltor, Archdeacon Young, Canon Haultain and the Revs. Bradley, Pay, Devlin, Weir, and Powell. In the evening, St Paul's choir gave a concert at the Mechanics' Hall in aid of the church funds which was largely attended. Gippsland Times (Vic), 1 December 1921. By The Right Reverend A. V. Green, D. D.
served in the Great War 1914 - 1918.